ADINA 8.1 has several enhancements to its cyclic symmetry analysis capabilities. The sparse and iterative solvers can now be used to solve cyclic problems. The primary cyclic component is no longer required to be aligned with the X-Y plane, and the axis of cyclic symmetry can have any orientation in space. 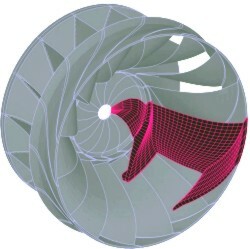 The above animation shows one of the mode shapes of a cyclically symmetric component with 15 cycles. Only the red section is modeled in ADINA. The rest of the model is generated from cyclic symmetry. Cyclic symmetry analysis is useful for components where the geometry and boundary conditions are rotationally symmetric. The loads, however, can be different on each cyclic part. Instead of generating and solving solution matrices for the complete structure, smaller sub-models are used. When these sub-models are solved sequentially we obtain the exact solution of the complete structure. This applies to static, dynamic and frequency analyses. The memory required for cyclic symmetry analysis is typically an order of magnitude less than that required for the full analysis, and the solution time can also be an order of magnitude smaller.